For its inaugural sale on Mainland China on 26 September, Christie’s has assembled a small but significant and entirely unique range of wristwatches, including a quartet of special Patek Philippe grand complications, and amongst them one-of-a-kind versions of the ref. 3939 as well as ref. 5016. A few months ago Christie’s became the first Western auction house to secure the license to operate independently on the Chinese mainland. Its first auction in China will take place in Shanghai next week, with a mixture of paintings, wine and watches. A dozen watches will go under the hammer, including several unique Patek Philippes and a rare Cartier Crash with a burgundy dial. 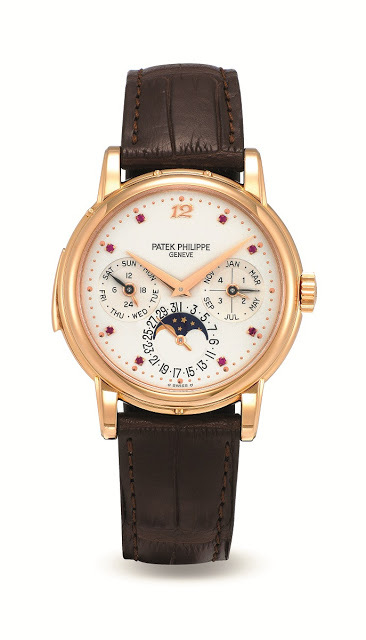 Though the Patek watches on offer include enamelled pocket watches and a cloisonne dial ref. 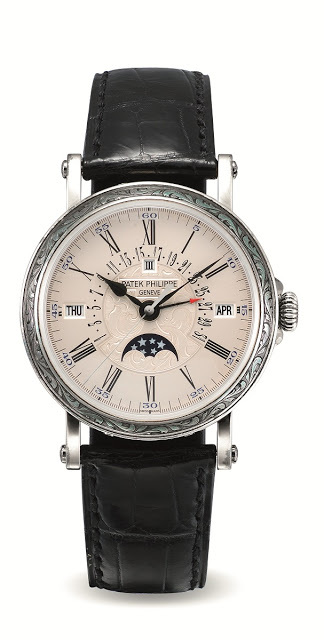 2481, the highlight of the sale is undoubtedly the four grand complications – comprising the refs. 3939, 3974, 5004 and 5016 – with matching, ruby-set silver dials and pink gold cases, presumably from the same owner. The first is the ref. 5004R split-seconds chronograph with perpetual calendar, with this particular specimen being only the second known piece with the ruby dial. CNY2,200,000 to CNY3,400,000 (~US$363,113 to US$561,174) is the estimate. Next is the ref. 3974R minute repeater with perpetual calendar. 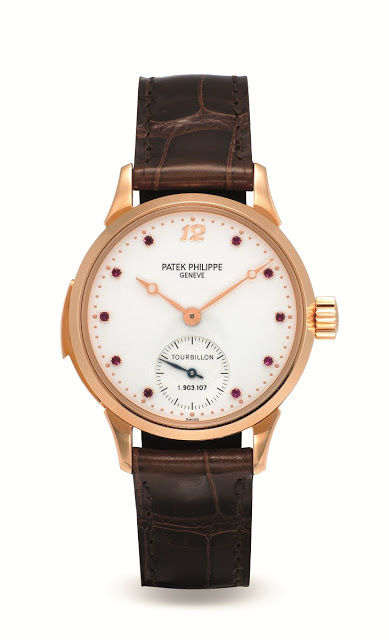 This ruby dial was fitted by Patek subsequent to purchase, and only 20 pink gold refs. 3974 are believed to have been made. This is estimated to sell for CNY2,800,000 to CNY4,200,000 (~US$462,143 to US$693,215). The third watch is the classic ref. 3939R minute repeater with tourbillon. Circa 2008, this is the only known ref. 3939 with a ruby index dial. It will probably set the buyer back CNY2,500,000 to CNY3,800,000 (~US$412,628 to US$627,195). And rounding up the four is the ref. 5016R. This too is the only known example of the model reference with a ruby dial. The estimate is CNY3,200,000 to CNY5,000,000 (~US$528,164 to US$825,256). 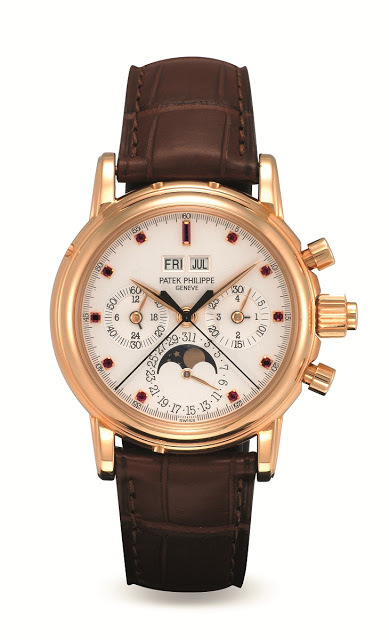 Also in the sale is a unique Patek ref. 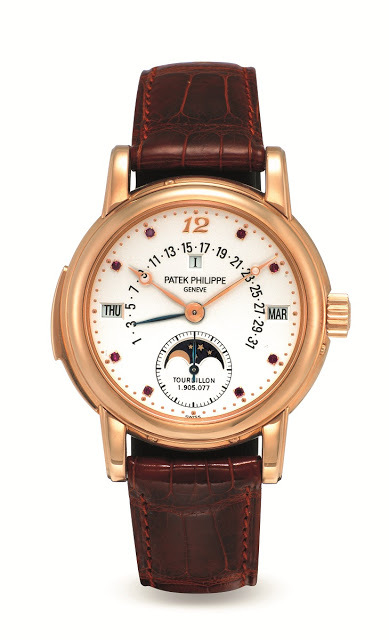 5159G with an engraved case, dial and buckle, customised at the owner’s request by Patek. The only known example of an engraved ref. 5159, this is believed to have been the prototype for the later, engraved ref. 5160. Unlike the ref. 5160, this ref. 5159 has a faint blued finished on the engraved parts and the engraved motif is different from that of the ref. 5160. CNY620,000 to CNY950,000 (~US$102,332 to US$156,799) is the estimate. 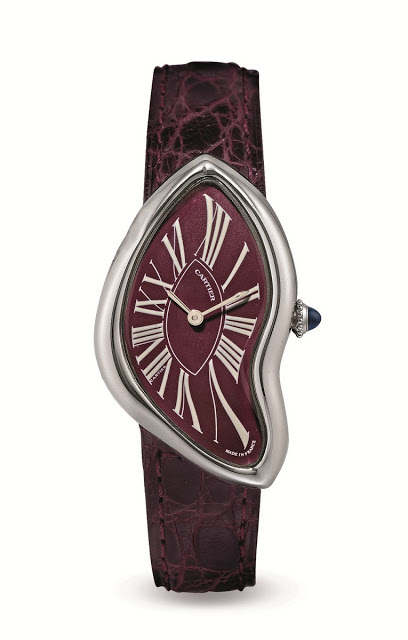 Another notable watch from the sale is the platinum Cartier Crash with a burgundy dial, estimated at CNY190,000 to CNY320,000 (~US$31,360 to US$52,816). Platinum is the rarest metal for this signature Cartier wristwatch, and the dial is a special order (the typical colour is silver).